Eve is often touted as a hard game to get into but I don’t think there is any feature that completely dropkicks new players into the ground and annoys old players more than the map. A mire of messed up connections, horrible presentation, poor spatiality and player position representation and lacking any actual, real, compounded information presented in any properly parsable way make it literally the poorest designed item in the game, even topping corp management and POS UI. Which is a feat in itself, and with much greater ramifications as well. But those are tall expectations to have of a piece of software that can’t even fulfil the very basic premise that it’s set out to do: just understanding the space around you and how it’s traversable. Perimeter seems further away from Maurasi than from Niyabainen, which is completely false, they’re both a jump away. Not to mention the visual confusion of lines crossing over each other. Let’s try the old map? 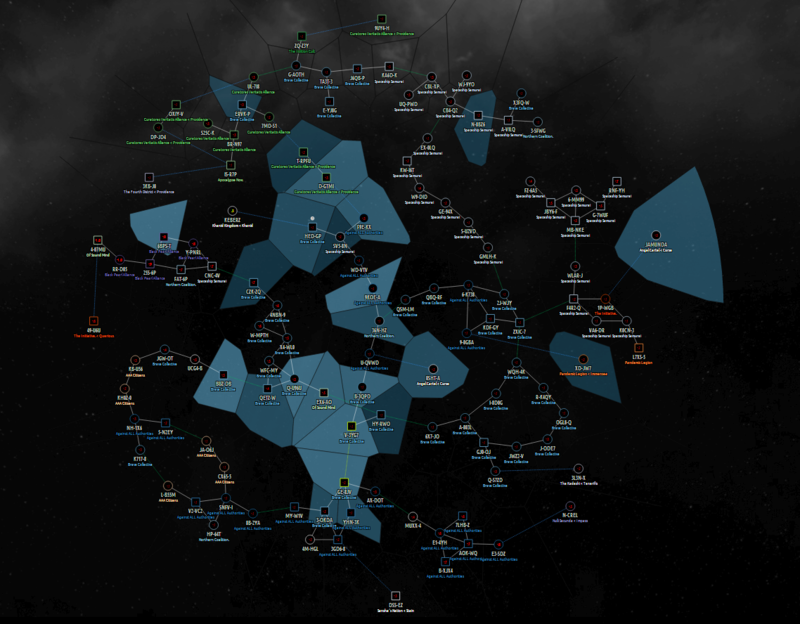 Ok, CCP can’t map their way out of a wet paper bag that failed paper bag school. Let’s try some of the other third party solutions. While Dotlan is the most obvious choice, let’s work through some of the alternatives first. Pirate’s Little Helper gets a pretty good rep, let’s see that in action. Hey, this isn’t too bad. 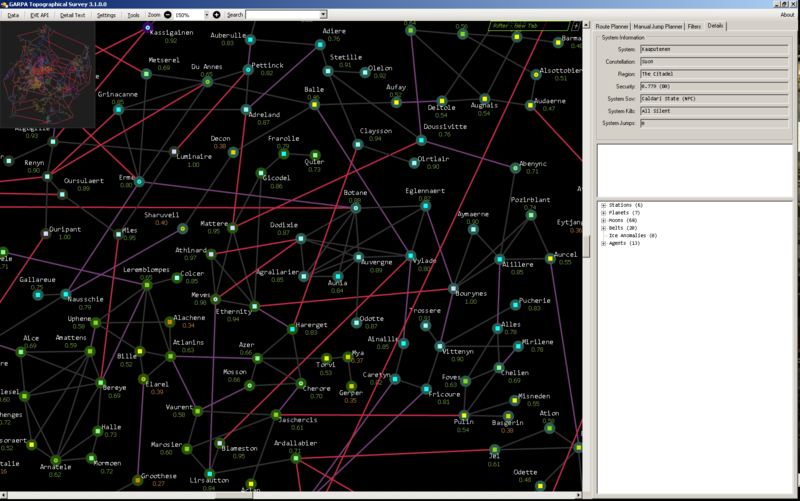 You get a clear view of distances and spatial relation at least, no overlaid lines, you can actually use it as a map! Wait, why did everything shift around? This is the same region i was looking at five seconds ago! Ok. It stopped. Right, so, that was pretty schizophrenic, but it was closer to something we could actually use. Let’s try GARPA? Goonswarm’s (rip) map project and API stealer, password cracker, trojan installer, dedicated in-house software. Note, this was the latest public variant I could find. … nopenopenopenopenope, with a topping of more NOPE. As expected, it doesn’t do well in a multi-region environment. Hey, how about Dotlan? Everyone and their moms are using it. Let’s have a look. Oh hey, finally, a normalized map that you can read and follow, and it shows sectioned space. Bonus for showing some pre-determined stats and stuff in a very vague way, I guess it’s better than nothing. Does anyone actually use the services shown in the tiny square as arrows? Didn’t think so. 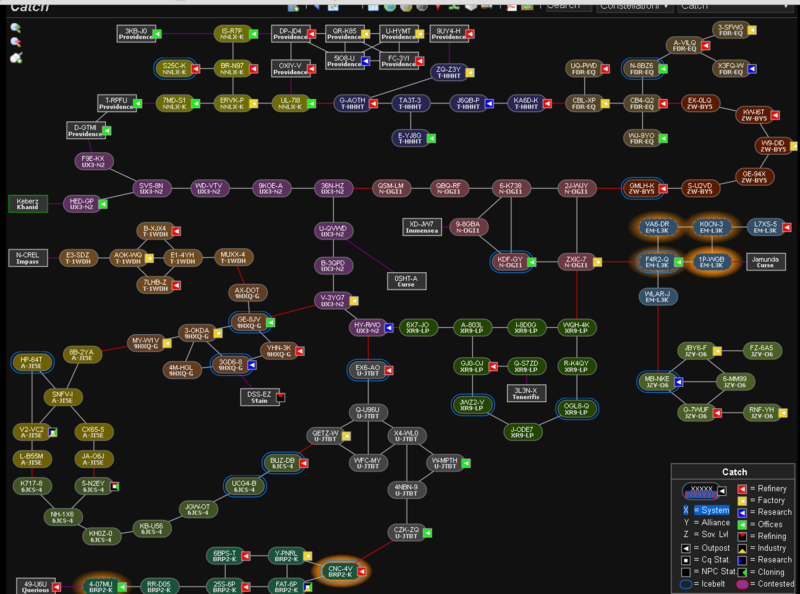 Ok, so, working step-by-step… I need to go ‘space south’ through Catch to Impass and …. wait, why the hell is Impass displayed on the LEFT? Like, on the same ‘side’ as Querios? Those are two very different regions in very different places! Maybe it’s a mistake, let’s try Vale of the Silent. Why is Geminate at the top? 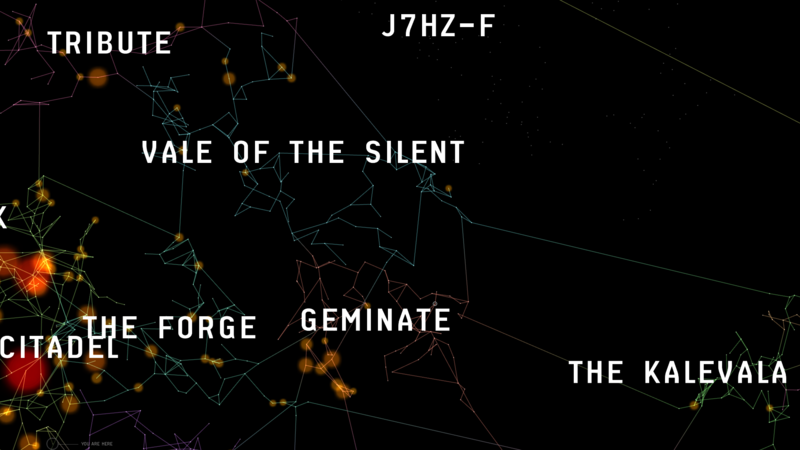 Did the Jove magically teleport the Geminate region to be smack-dab near Venal in the north? Is it an Illumittani plot? Additionally both Geminate connections appear to go ‘space east’ when we can clearly see they are a very definite north-south connection, even on Dotlan. Ok, let’s say we let that pass. 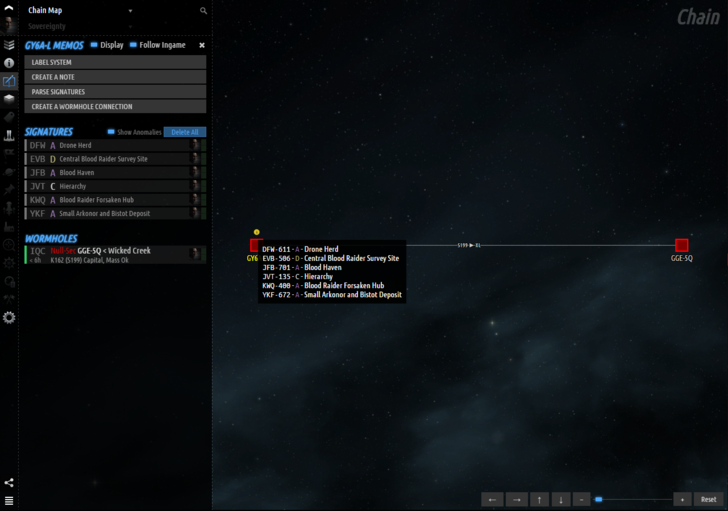 We have station info, kills in the last hour, it used to track you in game (rip browser) but it would be nice if it were moddable to show jumps or podkills specifically, or overlaid somehow, or some other options instead of the defaults. But that’s all we’re actually getting and if you don’t like it, you can go plex yourself. Dotlan only does things its own way, the same way grandpa did it! 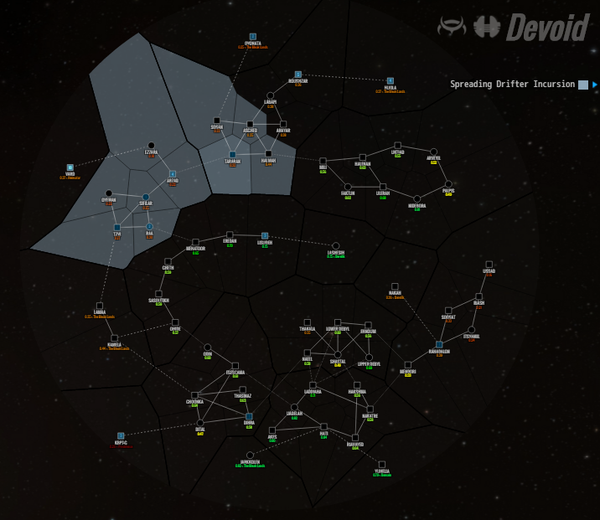 I really wish there were a good mapping solution out there which fills all the space-geographical needs of capsuleers. But, oh, what goes there on the horizon? PRAISE JESUS. Look at its normalized glory. Look at how exits are actually represented on the side of the regional map itself and are at the edge of the area, how backgrounds for the systems are customizable for info, same as the dot shape, color, intensity and a variety of other factors. 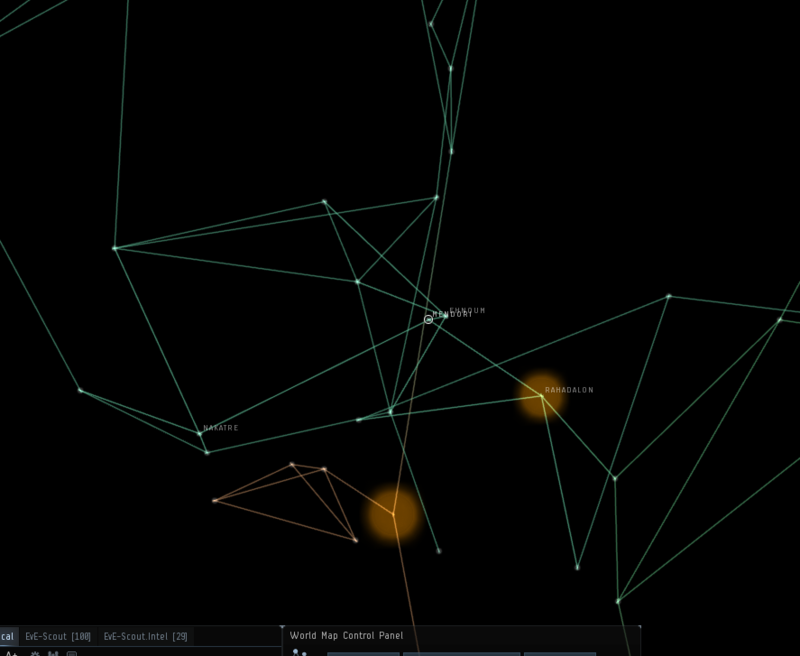 See how even constellations can be separated subtly by dark lines if you wanted. Look at that beauty. Fully legible even for a five year old. Distances are accounted for, the presentation is rational in context, and pretty to boot. Oh look, it also has a neat WH tracker aside from the k-space CREST-powered tracker! And a memo system on a per character basis! Hey, this is a pretty fantastic bit of third party software! But do you know what else this software is? Dead as a rusty door nail. 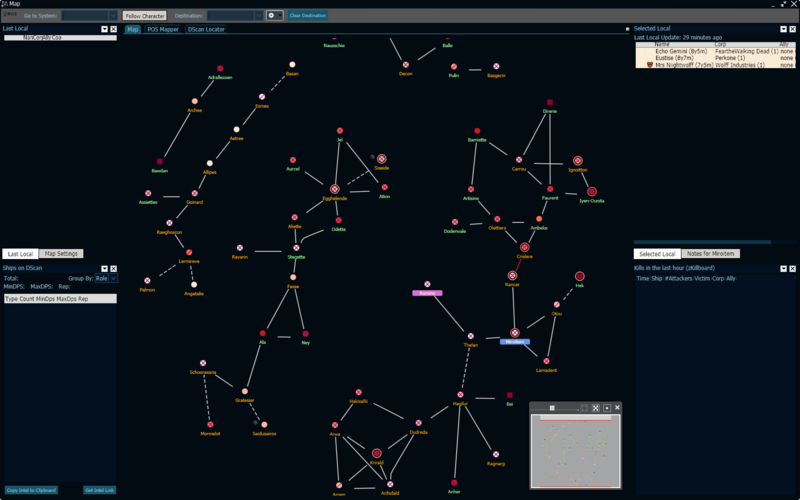 The project was called Eve Eye Maps, part of a bigger and much more intricate Eve Eye Portal site that housed a variety of tools and information, super customisable. But even if you were to just check the project for the map feature, it was way more than enough. It featured a jump calculator and route setter with detailed information on each system. You could also use the webapp to set a route/waypoints ingame through CREST/API magic, allowing you move all navigation out of the game to a second screen. Pretty nifty. It also offered a variety of custom maps, including a FW-only map, and a WH/Thera map which included an Eve-Scout interface which would auto-update Thera connections. I’d like to see Dotlan do that. 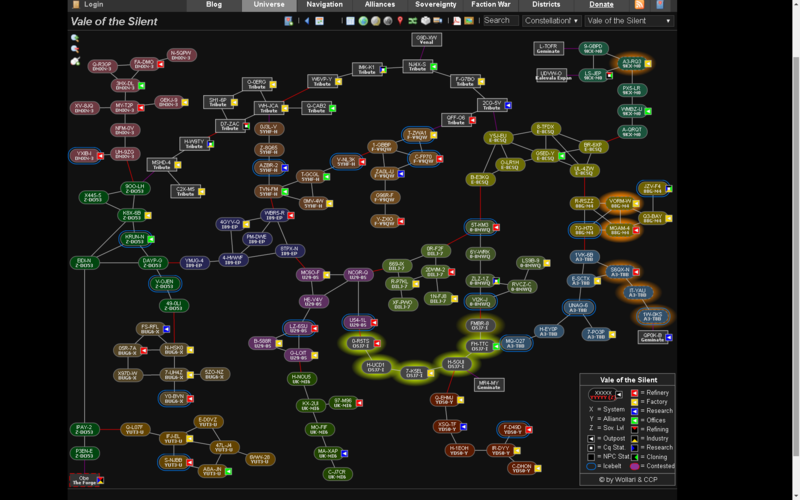 It also had hotlinks for systems to search on zkillboard and Eve-who/Dotlan for corps/alliances who were active there. Interestingly enough it even offered links to Reddit posts containing those terms for easier info gathering. With all this, you could have a good, solid peek into the history of that system. This fantastic bit of software also featured multiple presets. You could make an exploration preset to show/highlight stuff that interests you, like gatecamps and jumps in the last hour. 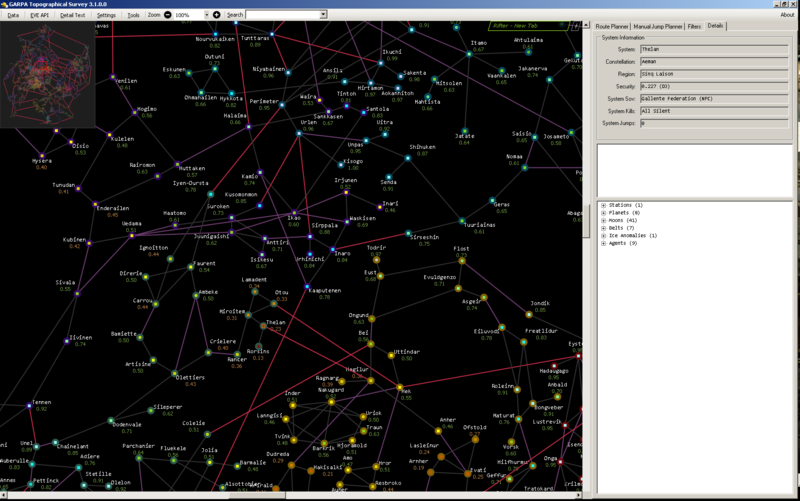 Or a hunting preset showing NPC kills in the last hour mixed with whether the system has a station. Anything you wanted to be shown, could be shown via those few sliders and drop-downs on an easily accessible and legibly parsed map, making the hardest part of your roam shooting the guys, not fumbling with the map. And I’m sure I’m not even remembering a many of options it had, since it really was absolutely packed with features, merging together into the ideal EVE mapping companion software that never really got the wide adoption it deserved. It should have been up there with Evemon and EFT. I’ve been in contact with the sole developer, Risingson, for quite a while, and even upheld his Patreon for as long as he could keep it maintained, but due to IRL responsibilities and tech matters, the project was mostly scrapped and closed down due to how expansive it was. 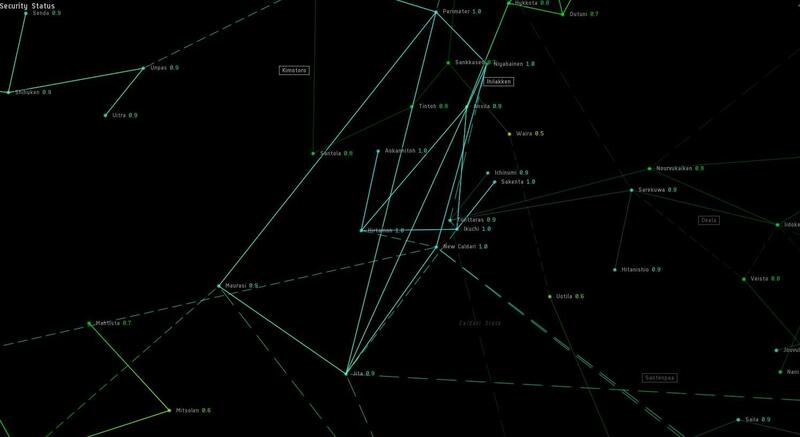 The future is very uncertain, but he has launched a new mapping project recently, as a companion for mobiles, starting with iOS with plans for Android. It’s a rework that starts from scratch and it may take a long time, if at all, until it reaches the full functionality of the previous version. So anyone hoping to catch the former full glory of the EveEye Maps will probably be disappointed. 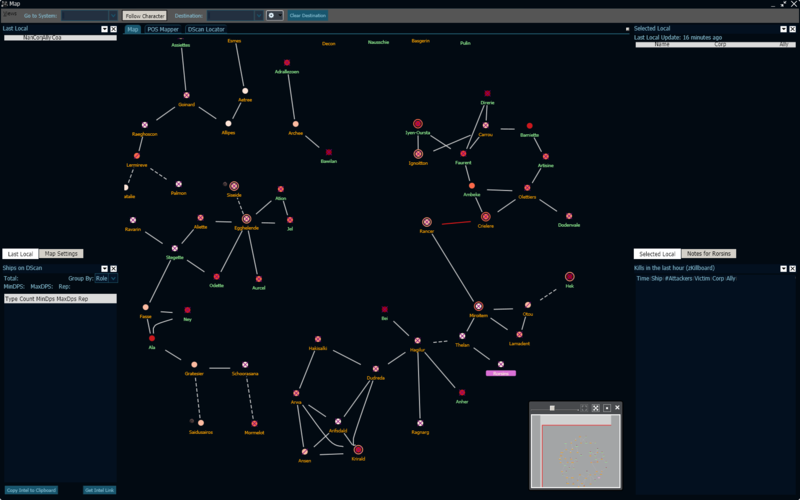 But the market is wide open, and the same resources that have been used before can be used again if anyone wishes to delve into the murky waters of third-party developing a solution for EVE’s forever-lingering mapping issues. I’m sure the horde of lost newbies and the frustrated vets will thank you.